I’m taking a break from steady track work. Yesterday I built a retaining wall that is in between the depot and freight house tracks. 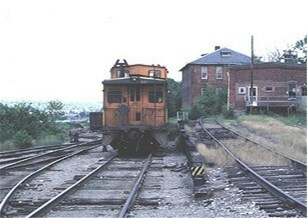 In the photo you can see it to the right of the caboose, marked by a yellow and black striped placard. The wall is necessary to help support the increased height of the freight house track where it is close to the depot track. Today I have been painting the depot itself first with the green trim color and then pad printing on the brick color. That’s being done in my home shop which is separate from the railroad location. Both activities are a welcome change from spiking, although I enjoy that, too. Besides the obvious benefits of more prototypical looking track, I have discovered several other benefits of track laid to P48 standards. The first is that very little flange clearance is required. This is quite important with my project because a lot of the yard track is planned to be buried over the tie tops. I only need to make sure the railhead itself is clear. On my previous railroad which used NWSL .145 wheelsets, this would not have been possible because the flanges were that much deeper. The goal of my project is to have rather decrepit looking track. I have found that in spite of the smaller flanges that track laid to and within gauge, tracking is quite good. This has been a pleasant surprise because I had anticipated some tracking problems and had thought I might need to do some serious truck equalization work. So far, testing with a rigid frame MTH truck and NWSL P48 wheels, the tracking has been trouble free. My experience thus far suggests that laying P48 track is really no different from “5 foot” gauge. For those of you who have hesitated, have no fear. After several queries as to my whereabouts, I thought I had better check in and report on this past month. It so happens we have seven granddaughters and this past month we have had contact with six of them. One flew in from CA, one got married in MI, and four down here in SC have recitals, competition, and a graduation. Needless to say, my efforts to keep producing on the railroad have been somewhat diverted. As of today, though, I am back once again driving spikes in Calais Yard. The last time I wrote I mentioned using a jig for placing tie plates. The conclusion after testing the idea is that it is easier to place the tie plates as I go along. Perhaps if one is doing mainline and the ties could be marked, it might work, but with the older decrepit look I am after, it adds to the work unnecessarily. As I have indicated before, much of Calais Yard trackage is covered up over the ties, so as much as possible I am trying to determine just where I need tie plates showing. By not putting tie plates in where they will never show, it saves time and labor. Most switches are done except adding closure rails and point assemblies. I do need to set up my first one complete to check on the servo operation combined with a working switch stand and rotating target. That will be a welcome break from spiking to do that. While in MI, I stopped at P&D Hobbies to get some parts, materials and a few decals. It is always so nice to walk into a store and find they know about your chosen scale. On the modeling bench I still have the depot to pad print with brick color and have started converting a couple of 5 foot gauge models with P48 parts. That is about the status of things. Don’t expect much in the coming month as it is gardening time plus graduations. Also, just driving spikes make for rather boring news. We are making progress, though.